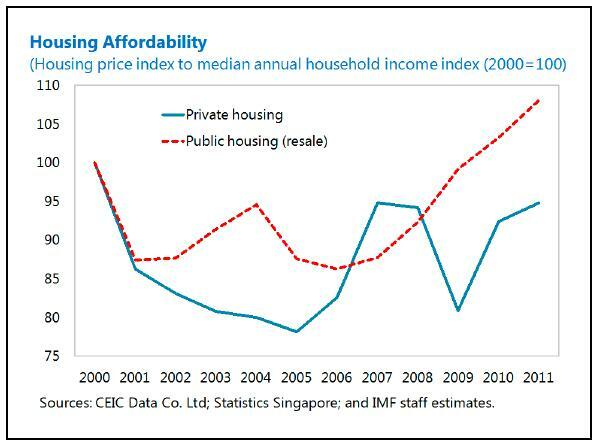 In Singapore, “indicators of housing affordability are mixed. House prices have risen more quickly than median incomes, especially for HDB resale housing. In addition, the tighter LtV ceilings raise the bar on qualifying for a housing loan. On the other hand, all-time low mortgage interest rates (about 70 percent of which are at floating rates, currently between 1⅓ percent and 2 percent) have reduced debt servicing costs,” according to a new IMF report on Singapore.